One thing our mid-season survey reflected was a need for greater clarity regarding how our sub system works. Every Sunday we have league games, a script on the website runs at noon to check for players who have marked themselves absent as well as players who have volunteered to sub. 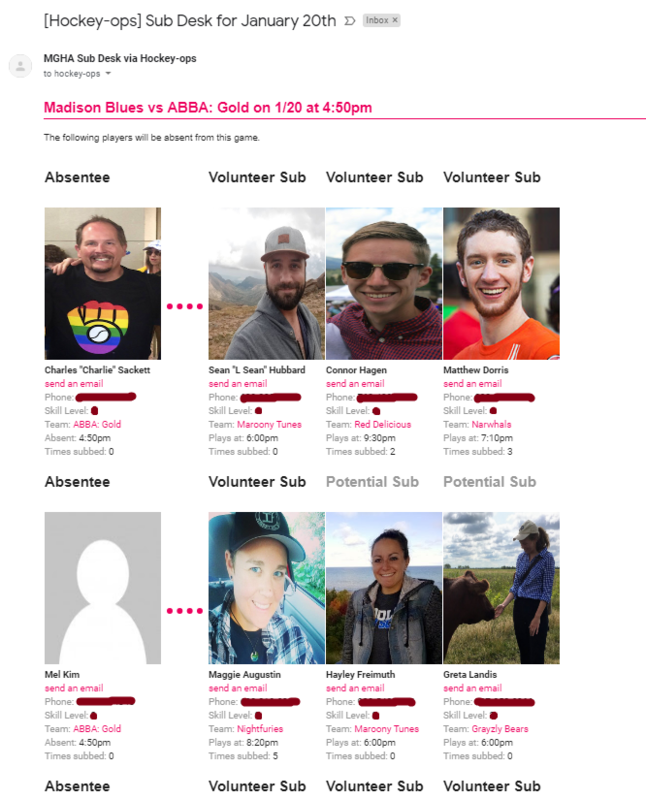 The script analyzes each absentee and volunteer and uses a combination of skill level, times subbed, and game time to determine sub suggestions. If there are no subs at the appropriate sub level for an absentee, a Potential Sub will be selected (someone of a similar skill level). Each sub is only suggested once per email. For more on this algorithm see here. The script puts all this information plus pictures and contact info in an email (see pic below from Sunday’s email) and sends it to the captains. The team captains then use this info to select a sub and contact them. If the contacted player replies yes, all done! If the contacted player cannot sub that day and time, the captain contacts someone else until they find someone. A note on last minute subs: yes, we still end up needing last minute subs. Life happens. Captains are instructed to make their best effort to match skill level and communicate with the opposing captains especially on last minute subs to address competitive balance. PLEASE mark yourself absent if you know you’ll be absent for your game. You can do this weeks in advance if you know. Please do it before noon on Sunday of the game you’ll miss. Volunteer to sub by marking all the game you are able to sub on the website before noon on Sunday. Make sure your contact info is up to date! Thank you and thank you Randi for all your hard work to make this system work!